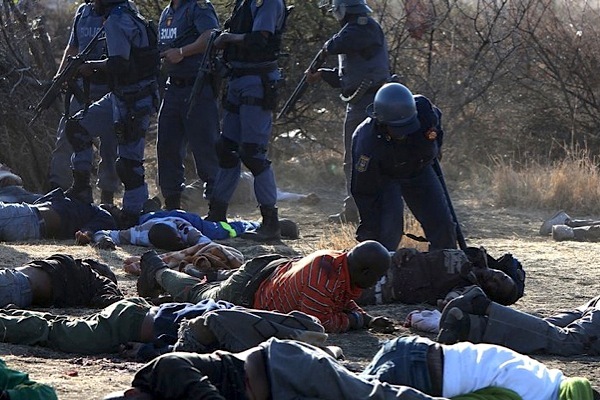 South Africa campaigners are shocked by the recently divulged official report on the police killing of 34 striking mineworkers at Lonmin's (LON:LMI) Marikana platinum mine in August 2012 and say it is a "gross defamation" of those who died. According to the Marikana Support Campaign (MSC), the 646-page report "squarely blames strikers for the violence", at the demonstration that ended with police opening fire on the striking workers northwest of Johannesburg. "By tarnishing thousands of miners as being responsible for the violent acts of a few, it becomes possible to conclude that the police had reasonable grounds to shoot (the) miners. In September 2012 the Farlam commission of inquiry discovered that police falsified and withheld documents related to the tragic event at Lonmin's mine, misleading prosecutors with false accounts of events. The incident is considered the worst violence outbreak in South Africa since the end of the Apartheid. The victims' families and survivors continue to seek compensation from the South African government.